Journalists stand at the front lines of history. They anticipate the events that will affect the course of our world and go after those stories. In 1972, reporter Philip C. Clarke chronicled the story of a critical victory for peace in the Vietnam War while the global community ignorantly maintained that the Army of the Republic of Vietnam (ARVN) was doomed to defeat. Clarke was â€œone of the few Americansâ€¦ to recognize the fighting at An Loc* for what it was: a siege and battle for the agesâ€ (Swofford, A4). Clarke, who had been to Vietnam on several fact-finding missions during the war, appealed to The New York Times to send him to cover the siege, but was refused, because â€œmost Americans by then didnâ€™t want to read or hear about the Vietnam Warâ€ (Swofford, A4). Readerâ€™s Digest sent him instead. A veteran journalist, Clarke was well traveled and experienced with extreme situations. He spent many years in Washington working for the Mutual Broadcasting Company. Earlier in his career, he was General Editor of foreign affairs with Newsweek magazine, specializing in NATO and U.S.-Soviet relations. For 13 years prior to that, he served as a reporter to the Associated Press (AP). During his tenure with the AP, the worldly reporter was stationed in such places as Havana, Rome, Paris, London, Teheran, and the U.N.
Clarkeâ€™s time in Vietnam would affect his life forever. 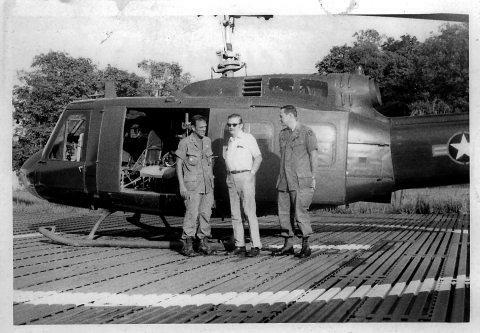 It became his personal mission to â€œhonor all of the U.S. Army advisors who remained behind in Vietnam to safeguard our withdrawal [and] bind the spiritual wounds left from that tragic conflictâ€ (Duplantier, 2). He is an amazing example of a true patriot and a conscientious journalist. Was An Loc worth the price? In terms of human endurance and determination, the battle marked a turning pointâ€¦ the North Vietnamese, their dreams of military conquest shattered on the perimeter of An Loc, had finally agreed to negotiate seriouslyâ€¦ An Locâ€™s defenders had broken the enemyâ€™s offensive and helped to turn the tide toward peace in Vietnam (156). Clarke attributed the three-year postponement of the fall of Saigon to the victory at An Loc, as well as the safe return of Americaâ€™s 65,000 remaining troops and the signing of the Paris Peace Accord (Duplantier, 2). But the significance of An Loc was overshadowed by the costs of the early withdrawal of U.S. support. Clarke believed that after the failure of the Easter Offensive, â€œgiven a few years and continued U.S. help, [South Vietnam] could [have gone] it aloneâ€ (â€œLessons,â€ 14). But as he left Vietnam, Clarke knew this was not to be. We, the Americans, had come to this strange and far-off land to see, to learn, to help. But when we departed to return to our own people and our own concerns, we left behind a young and struggling nation, too alone and vulnerable (â€œLessons,â€ 13). Though Vietnam was abandoned prematurely, Clarke still recognized the benefits of our military efforts. Through the rearview mirror of history, Clarke asserted that the battle of An Loc and the defeat of the Easter Offensive were significant to the political evolution of the entire region of Southeast Asia. While communist forces were invested in the struggle for South Vietnam, â€œother dominoes that might have fallen,â€ were able to strengthen their economies and national defenses (â€œLessons,â€ 9). After the war, to Clarkeâ€™s disbelief, the media that had so generously covered such atrocities as My Lai during the Vietnam War said little of the devastation unleashed on the free peoples of Indochina after U.S. withdrawal. Clarkeâ€™s journalistic vigilance continued to direct public attention to the true repercussions of Americaâ€™s withdrawal from Vietnam, despite the overwhelming tide of flawed judgment and misinformation in the major news media. Pol Potâ€™s Khmer Rouge began methodically to butcher an estimated 2 million [Cambodians]. Tens of thousands of South Vietnamese have disappeared, unnoticed, in Hanoiâ€™s infamous â€˜re-educationâ€™ camps. Entire villages of Laotian mountain people have been wiped out by Soviet-made chemicals called â€˜yellow rainâ€™ (Clarke, â€œLessons,â€ 5). Clarke fought against the negative media-driven tide that crushed U.S. public support for the war and degraded the sacrifices of our soldiers. The mediaâ€™s bias undermined support for Vietnam â€œat a time when national unity might have brought successâ€ (Clarke, â€œLessons,â€ 5). The people of Indochina, our military men, and our countryâ€™s identity all suffered long-term consequences from this misrepresentation. The Vietnam in which Clarke lived and worked was not the Vietnam the media and the government created for the American public. He observed the interaction between the Vietnamese and Americans first-hand: â€œI visited scores of villages and hamlets rebuilt by American civil action teams, traveled over countless miles of highways hacked by our engineers, and encountered vast numbers of South Vietnamese civilians who confidently entrusted their lives and fate to our handsâ€ (Clarke, â€œLessons,â€ 14). Clarke also worked hard to dispel other myths of Vietnam such as â€œthe undisciplined, drug-ridden and trigger-happyâ€ American soldier. â€œThe vast majority of American troops fought courageously and well under unimaginably difficult circumstancesâ€ (â€œLessons,â€ 7). As a field journalist, Clarke interviewed the men of Combat Assistance Team 70 who served as advisors to the ARVN at An Loc, at Lai Khe, a military outpost near the besieged village. He recorded their graphic tales of what Col. Walter F. Ulmer, Jr., leader of the team called, â€œthe absolute limit of human endurance.â€ It was a relentless nightmare. â€œBy late April, An Loc was being pounded by more than 2,000 rounds per dayâ€¦â€ at the assaultâ€™s climax on May 10th, â€œ8,300 rounds of high-explosive in ten hours, or nearly one every four seconds,â€ was unleashed by the enemy on An Locâ€™s defenders (â€œBattle,â€ 153-5). He was also there to record the uniquely human moments that truly define such an earth-shaking experience. He was able to gather accounts of the singular act that galvanized the defenders: â€œFrom the roof of Phuc Quang schoolhouse, a diminutive 15-year-old [sic], his frail body clad in the black uniform of the regional militia, raised his rocket launcher and fired point-blank at an oncoming T-54. As the tank burst into flames, the boy gave a triumphant whoop. Quickly, other defenders equipped with LAWsâ€”light anti-tank weaponsâ€”and taught how to use them by American advisers [sic], fired on dozens of enemy tanksâ€ (â€œSiege,â€ 18). He also found impossible stories of kindness such as the â€œARVN captain [that] made room in his artillery shelter for a pregnant widow and her four small children, risking his life daily to scrounge for food and water for them. When the woman gave birth and both baby and mother died, the captain â€˜adoptedâ€™ the four orphaned childrenâ€ (â€œBattle,â€ 155). He painted these images against the inhumane backdrop of a small village held captive by terror and despair: â€œScores of bodiesâ€ lined the streets and â€œhad to be reburied after exploding shells destroyed their gravesâ€ (â€œSiege,â€ 52). Clarke knew that the handful of advisors from Combat Assistance Team 70 of the U.S. Army were the driving force behind the unlikely victory at An Loc. â€œTeam 70 membersâ€¦ would help direct the battle, especially pinpointing air strikes for the B-52 pilots who dropped hundreds of bombs on the North Vietnamese.â€ It was their â€œextraordinary heroismâ€ that led An Locâ€™s 5,600 defenders to overcome the attack of 36,000 North Vietnamese troops and â€œsave Saigon for another three yearsâ€ (Swofford, A1). The moral support of the American troops, according to Clarke, was an even greater factor than their technical support at An Loc. â€œOne of the major roles of the Americans was to inspire confidenceâ€ (â€œSiege,â€ 52). Deeply impressed by Team 70 advisorsâ€™ endurance and bravery, Clarke asked President Nixon to grant a Presidential Unit Citation to the outfit. The Nixon White House was pleased by the idea, but soon became consumed with Watergate, pushing such matters aside. Decades later, Clarke still felt as passionately that the men should be recognized for their role in one of the most impossible victories of the Vietnam War. â€œDamn it all, those guys deserve it,â€ he told Swofford (A4). It was 27 years after the battle that Clarke finally succeeded. Following the second reunion of Team 70 in 1995, Clarke was inspired â€œto try once again to get a presidential citationâ€ (Swofford, A4). After getting no response from the Clinton White House, Clarke wrote to his state senator, Jesse Helms, R-N.C.
To obtain approval for the citation, â€œClarke had to do a lot. He amassed a 2-inch-thick stack of personnel records, military logs, recommendations by military brass, battle maps, and accounts of the battle. It took him a year.â€ Col. Ulmer, said of the tenacious journalist, â€œhis perseverance is amazingâ€ (Swofford, A4). Clarkeâ€™s determination finally paid off in 1999. As the official citation reads, Team 70 was recognized by the government they had served for â€œbolstering morale through their example of unflagging determination and Esprit De Corps [and performing] a pivotal role in turning back the enemyâ€ (Swofford, A4). This was an inestimable feat against circumstances in which they were not only outnumbered 6 to 1, but their government and their country had all but abandoned them. For Clarke, An Loc was â€œa lasting chronicle of courageâ€¦ a silent testimony to the indomitable, unconquerable human spirit,â€ not to be forgotten or underappreciated. (â€œSiege,â€ 53). His journalistic drive and patriotic spirit ensured that America would not soon forget. The story of Clarkeâ€™s son offers further testimony to the reporterâ€™s tenacity and resourcefulness. Clarke adopted his son, Nicholas, while on assignment in Greece in 1958. An exciting story he relates in The Saturday Evening Post, his son was the first orphan adopted under a new immigration bill signed by the President only days before his arrival in the U.S. Under a very tight schedule, an endless stream of bureaucratic snags threatened the success of the adoption and immigration of little Nicholas. Clarke used all his resources and journalistic know- how to barrel through the procedural nightmare, gaining the support and sentiment of the entire Greek nation in the act. Clarke, Philip C. â€œThe Battle that Saved Saigon.â€ Readerâ€™s Digest March 1973: 151-6. Clarke, Philip C. â€œThe Lad and I came Through.â€ The Saturday Evening Post May 3, 1958. Clarke, Philip C. â€œThe Lessons of Vietnam, 1975-1985.â€ Americaâ€™s Future: 3-15. Clarke, Philip C. â€œThe Siege of An Loc: A Chronicle of Courage.â€ The American Legion Magazine July 1985: 18-19, 52-3. Swofford, Stan. â€œHonored at Last.â€ News and Record, Greensboro, North Carolina July 25, 1999: A1, A4. * â€œAn Locâ€ is used interchangeably with â€œAnlocâ€ throughout the source material. For ease and consistency, I have used â€œAn Locâ€ in all cases without denoting an alteration to the original text.